The second day trip! Apologies in advance for the crap photos in this post. 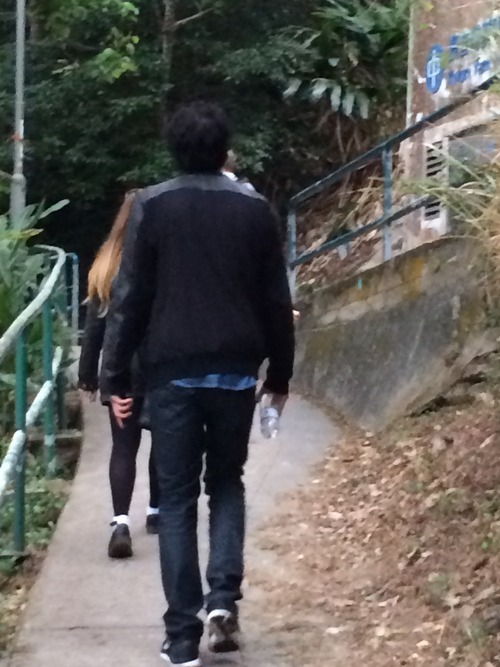 This reminded me of that time, not so long ago, Joe and I visited Lamma Island. 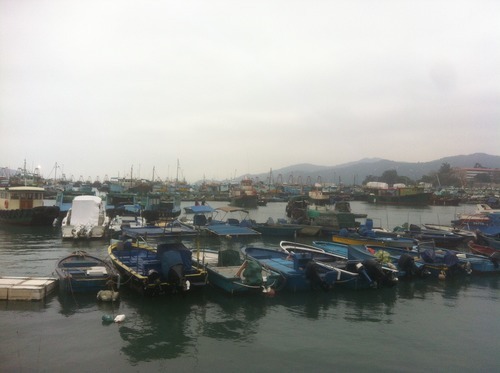 Cheung Chau is another little island in Hong Kong that is ripe for a day trip. Again, as with this whole past week the boys were here, the weather was seriously grotty. If the weather had been nice I’m sure it would have made the beaches look prettier and less full of rubbish… Or the houses look less old and worn. The sunshine brightens everything up. To be fair, I’m being a bit harsh here. The island had a great feel, lots of little streets with informal eats, art and a good variety of holiday tat. Something that is always key for me! The seafront was busy, and there were so many boat in the port, most of which were quaint little fishing boats which again reminded me of visiting villages like St Ives in Cornwall. We pretty much walked around the whole island, which really isn’t that hard considering it is only small. 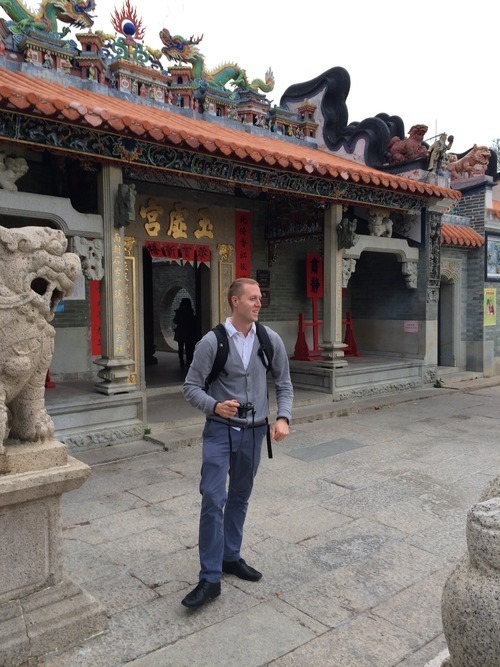 We visited the Tin Hau and Pak Tai Temples, both of which are over 200 years old. The Pak Tai temple stands at the top of a massive square where villagers congregate and local festivals take place. I loved the stone dragons out the front guarding the entrance. Pak Tai is the Supreme Emperor of the Dark Heaven and God of the Sea. He earned his deity after he defeated the evil Demon King. You’ll notice that in the temples devoted to him, the bronze tortoise and serpent under the feet of his image signifies that the good always prevails over the evil. The name Tin Hau comes up a lot in Hong Kong; Tin Hau is actually a goddess The Queen of Heaven and Protector of Seafarers. She gained her status after saving her father and brother from a typhoon, which was sure to have sunk their junk boat. She was also able to predict rough weather but sadly died young in her twenties in the eleventh century. We also took a walk on the ‘Mini Great Wall’, which is essentially a paved path along the south east coast of the island. The views are amazing, and I’m sure that on a brighter clearer day would be even better. However, I was pleased that the weather was cool otherwise it would be a much harder slog to get to the lookout point! At one point we did think we were lost, and I must admit I was starting to worry because the sun was fading. Luckily we bumped into a guy who showed us the way back, which was essentially the way we came but I have no idea how we got to where we were, all a bit disorientating! the weirdest thing about the walk is that along the route there were plaques directing you to look out for rocks that looked like things, except they really didn’t. This was like cloud watching on a really bad day. The island is seriously famous for its buns. Yes buns I tell you. 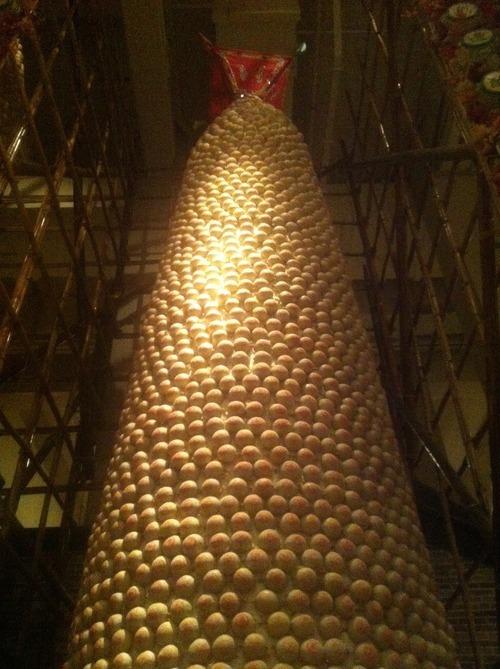 There is a huge festival here once a year that includes a bun scramble – three towers over 60 feet tall covered in sweet lucky buns. The competitors climb up and try to out bun each other, that is trying to collect the most buns. This is obviously the main event and reminds me much of the infamous cheese rolling festival in Gloucestershire. But the reason behind it all (of course there is reason who would want to steal buns for fun anyway?) dates back to a plague that devastated the island in the late Qing dynasty. So the islanders built a tower in front of the Pak Tai Temple and asked the god to rid the island of the evil spirits causing the devastation. They also paraded statues of deities through the village and it is said after the plague ended after their parades, hence which is why the ritual has become a yearly tradition. The next festival is May, and I’m not going to miss it. I can’t promise to be as adventurous as the competitors but I’ll certainly cheer loudly for them!